European Natural History Collections – What’s Missing? I am working on improving the metadata on European natural history collections as part of the Synthesys project. 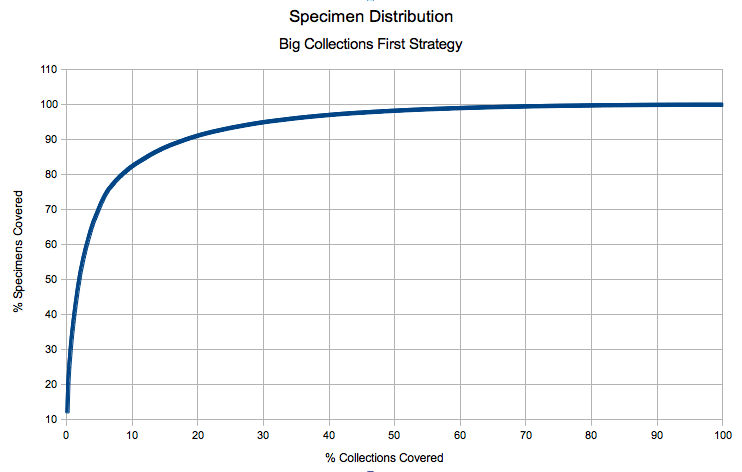 In an earlier post (Big Collections First) I did an analysis of the data in the Biodiversity Collections Index. I am now building a more detailed list of those large collections (the ones believed to contain more than a million ‘specimens’) of which there appear to be around sixty. These account for most of the biodiversity material in museums in Europe. As I worked through the list I began to match them up against data sources in the GBIF Data Portal but this task became tricky as there were data sources in GBIF that had the names of museums but were clearly the results of observational studies and not catalogues of specimens. I decided to break off and do an analysis of what was in the GBIF Data Portal by way of specimens residing in Europe. This post is the results of that analysis. Continue ReadingEuropean Natural History Collections – What’s Missing?